Meanwhile, your ship sails to meet you in Medemblik. In the evening you enjoy a convivial evening on board. After spending the first night on board, you sail across the Frisian Sea to the Island of Texel. In the afternoon, you make a circuit inline skatetour of the island on skates (40 km). In the evening you are free to have a look around one of Texel’s villages. From the harbour at Oudeschild you sail to Den Oever, where you can choose to go on a inline skating trip across the sea-dam to Makkum (about 40 km). If you prefer to sail, you can stay on board the ship for a voyage to Makkum. You spend the night here in the pleasant harbour. The next day you inline skate along part of the route of the famous Elfstedentocht, the Eleven Towns race. You will skate from Makkum via Stavoren to Heeg (about 50 km). If the weather is bad, we will stay in Stavoren. 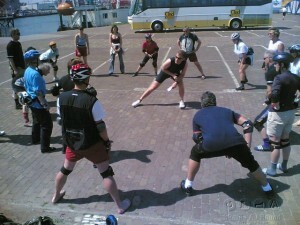 There you can participate in an inline skating workshop for advanced skaters. The last day, you can participate in an optional ‘early-bird inline skating tour’. From Stavoren you sail back across the IJsselmeer to Enkhuizen. Enjoy the fresh wind while you still can, because before you know it you are mooring once more in the harbour at Enkhuizen, and it is time to disembark. Every day it’s up to you whether you go with us on the inline skatetours or you stay on the ship. It was a wonderful and great tour through best of holland. I enjoyed the time on board and the time on skates.